There are so many ways to whip up a delicious batch of sweet potatoes. Here are three of our favorites. Growing up in the Southwest, my only experience with sweet potatoes was at Thanksgiving, when they appeared on the table in a casserole dish, mashed and smothered in melted marshmallows and brown sugar. We considered this to be a healthy vegetable side. We weren’t totally wrong, because the sweet potatoes that lurked underneath the swamp of sugar were, in fact, chock full of vitamins and nutrients. The sweet potato, an extremely versatile tuber, has been around for many centuries. Scientists believe that the sweet potato was domesticated thousands of years ago in Central America, making it one of the oldest vegetables known to mankind. Christopher Columbus brought the sweet potato back from his very first voyage to America in 1492 and introduced it to Europe in the 15th century. It made its way to China in the late 16th century, and spread throughout Asia, Africa, and Latin America during the 17th and 18th centuries. The sweet potato is still wildly popular today. Found in dishes served from dawn until dusk, a sweet potato fan could start his or her day with sweet potato pancakes and end it with a piece of sweet potato pie served a la mode with a scoop of sweet potato ice cream. Because of its sugary flavor, the sweet potato tastes decadent, but is in fact fat free, fiber-rich, low-calorie (105 calories), and loaded with vitamins! According to Health.com, one baked, medium-sized sweet potato contains 438% of your daily value of vitamin A—a white potato contains 1%)—as well as 37% of your vitamin C, and some calcium, potassium, and iron too. This nutritional content makes this peach-colored potato a super healthy choice, and its versatility has led to a veritable sweet potato recipe explosion. Stefania Manetti, RD, showed us three fun ways to mash, hash, and roast sweet potatoes in the mouthwatering and health-boosting recipes below. Preheat to 425°F. 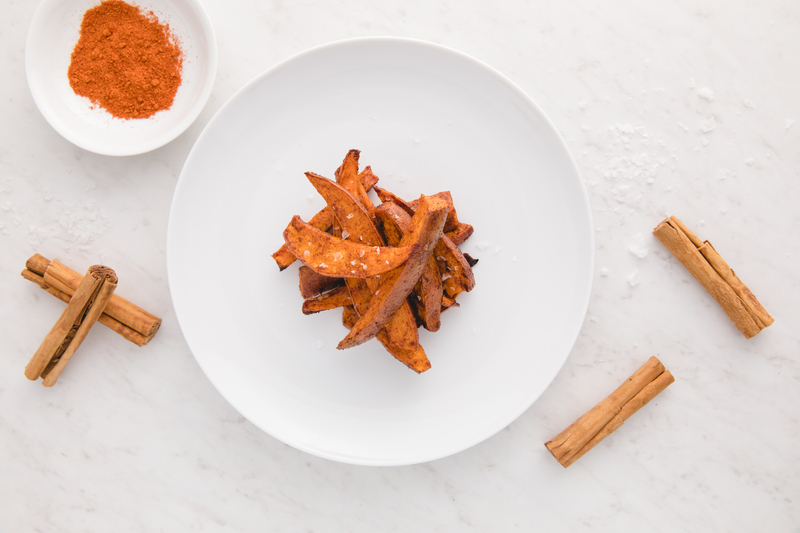 Cut the sweet potatoes into “fries,” or cube them and mix them in a bowl with the olive oil, cayenne pepper, and cinnamon. Place flat on a baking sheet and bake in the oven for 20–25 minutes. While preparing the potatoes, bring the water to boil. Add the sweet potatoes and cook until tender, about 15 minutes. Mash with a potato masher. Fold in the yogurt and season with cardamom (or cinnamon). Add the warm milk a little at a time. The amount of milk can be adjusted based on the creaminess desired. Season with a little black pepper and serve. In a medium lightly oiled saucepan, cook the sweet potatoes and onions on medium to high heat for 6–7 minutes, add in the bell peppers and cook for 2–3 minutes. Add in the eggs and black beans and cook until eggs are cooked through. Season with salt and pepper. With recipe possibilities that include sweet potato chowder, quesadillas, and ravioli, the options for this tubular treat seem infinite. My personal favorite is sweet potato toast, which is stealing the spotlight from its popular cousin, avocado toast, on breakfast menus everywhere. I also love ordering sweet potato fries as a healthier alternative to traditional french fries. I am always excited when a baked sweet potato topped with cottage cheese appears on the latest fad diet I am trying to follow. It turns out that sweet potato crops are super hardy, surviving in a variety of ground conditions.They also require less water than most crops, making the process of growing and consuming them climate-friendly. Grown in more developing countries than any other vegetable, the sweet potato continues to appear on the plates of new communities each year. After seven centuries, this beloved tuber continues to thrive, and it may prove the vegetable of the future—it’s been selected as one of the crops for NASA’s Advanced Life Support Program. In addition to being a part of the astronaut’s space diet, sweet potatoes are on the short list of vegetables that NASA is planning to grow in space. Whether served on a holiday table or inside a space shuttle, sweet potatoes seem to be the vegetable that everyone adores. Let us know if you have a favorite way to serve up the sweet potatoes on your plate.